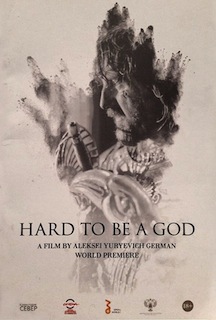 Movie Review: Dated from 2013 but actually being exhibited in NYC theaters in 2015, “Hard to Be a God” is the swan song from Russian filmmaker, Aleksei German, who died in 2013. The film is a freakish three-hour odyssey, with dark venues on the background, based on the 1964 novel of the same name by the brothers Arkady and Boris Strugatsky. Adapted by Mr. German and Svetlana Karmalita, the script is outlandishly drawn by an endless succession of abominable experiences and killings, presented in black and white, and set in a medieval, outer planet called Arkanar. The foggy, swampy, and muddy landscapes, together with the fierce hunt for thinkers and wise men, throw us into a chaos taken from the most hellish descriptions by Dante. Imagine a nefarious version of “Lord of the Rings”, with no magic or color, and injected by indecency, violence, eccentricity, and eeriness. The film starts by introducing the feared noble scientist, Don Rumata (Leonid Yarmolnik), who is sent from Earth, in an attempt to save the persecuted wise ones. But for that, he will need the help of a doctor, Budhak, who had disappeared mysteriously. Seen as a God, and with more than 300 ears cut from the evildoers, Rumata will become fatigued from the murkiness that reigns in the planet where nobody seems to have a heart. Sometimes the film moves in a confusing way, bursting with so many odd characters and huddled scenarios – the ones that you can almost smell the pestilent air. The film wouldn’t lose meaning if trimmed for at least half-hour, but what might be exhaustive for some viewers, becomes a delight for others, especially for the enthusiasts of bizarre art house with a hint of classic. Here, one can find some terms of comparison with the last Ben Wheatley’s “A Field in England” and the Czech classic “Marketa Lazarova”. Monstrous and hilarious by turns, “Hard to Be a God” is a grotesque epic that despite nauseous, grabs you by the balls.